Step on a Skateboard. Learn how here. 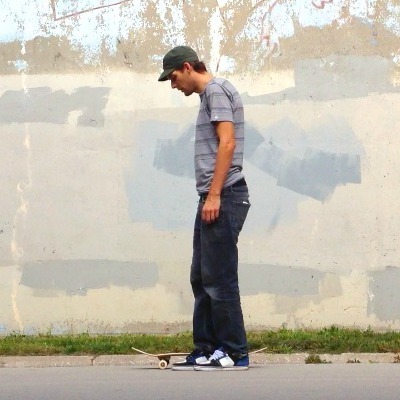 To step on a skateboard the first time is a challenge. Skateboards seem unstable and dangerous. Every time you touch it you almost flip over. How can you get on without killing yourself? It makes you wonder; how is it possible to stand of that thing? And what about those dare-devils with all those crazy tricks they do? How can that be possible? You can step on a skateboard too. I will teach you the technique here. Then with a little practice it will be easy. The first steps develop your balance. Soon you will be able to step on – no problem. Some things you need to know first. Falling will happen but injuries can be lessened or even prevented. So let's learn to fall without getting hurt. Learn how to do it right and the fear of falling will fade. 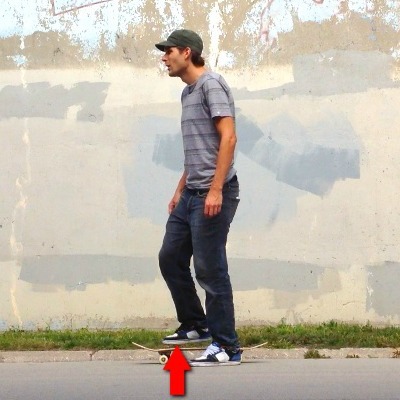 The best technique for riding a skateboard is to stand on your front foot and push with your back foot. This is the quickest way to step on and be in proper stance. After a little practice you will be able to put your front foot on, push off with your back foot and roll away. 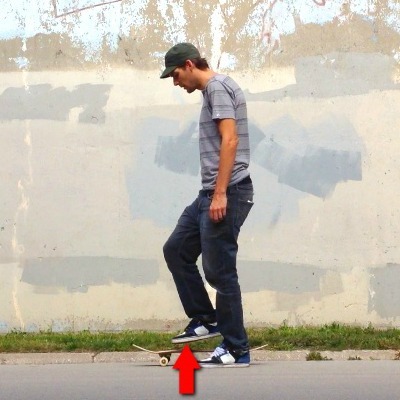 To get onto a skateboard you need to know your center of balance and how it is connected to the ground. Ground is solid and it doesn't move. We are all used to pushing on the ground to walk and run. Turning and stopping is no problem. We are used to pushing and having the ground just, you know, be there. We connect the weight of our body with the ground using our sense of balance. A skateboard is different. It rolls. If you push on it at an angle it will roll away. Sometimes taking you down with it. I will show you how to use a skateboard with your natural sense of balance. With just a bit of new skill. 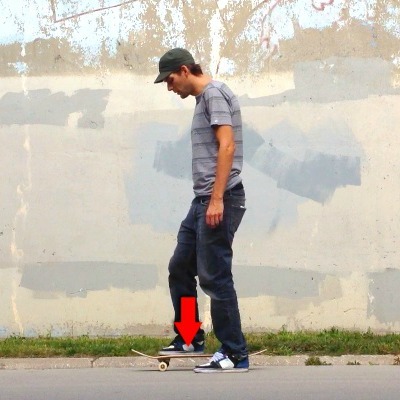 The following steps show you how to step on a skateboard without tipping over. You will stay connected with the ground and your center of gravity all the way though. We are going to step on a skateboard straight up and down in a balanced way. You and the skateboard will not roll side to side. Both will stay in the same place. You gotta step and shift your weight straight up and straight down. Any angle or side to side motion will set you off rolling. We don't want that. 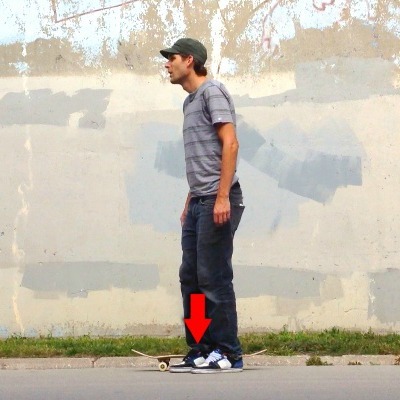 Make sure you are on a smooth surface where the skateboard can roll freely. The wheels must be able to roll so you can develop the balance needed to stay on. Check your stance. Are you regular or goofy foot? I am goofy so the the pictures are for a goofy skater. Keep your knees slightly bent throughout. 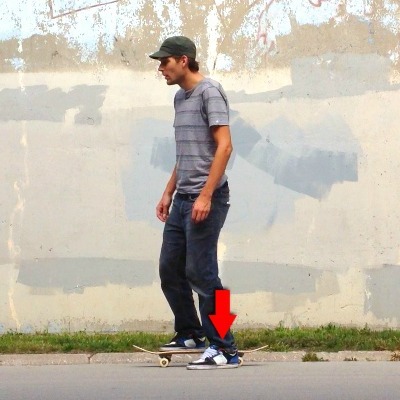 A slight crouch helps your balance while on a skateboard. 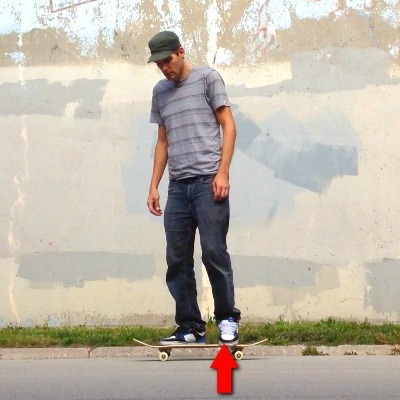 Stand next to the skateboard in the middle, with your front foot slightly forward. 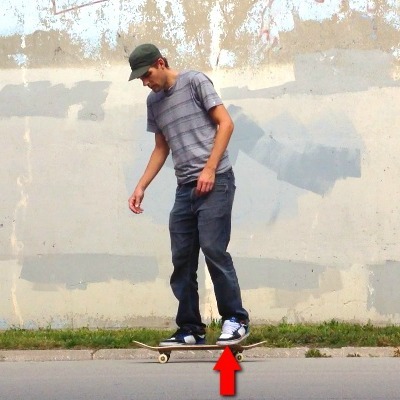 Lift your front foot straight up and move it over to the front bolts of the skateboard. Then put your foot straight down onto the skateboard. Once on slowly shift your weight to the front foot by pushing straight down on it. Do so until your are equally standing on both feet. Maintain the straight up and down balance. Now start to place more weight on your front foot. Lift your back foot straight up and up and onto the board. Equalize the weight between both feet. Now you are on! Woo Hoo! To get off maintain your balance by moving and shifting straight up and down. Start shifting weight to your front foot and lift your back foot straight up. Move the back foot off the board and back onto the ground. Shift your weight back to the foot on the ground. Lift the front foot straight up. Place it on the ground. Awesome! You did it! Do it over and over to get the feel and confidence. Practice will train you and it will get easier. Stand with the knees slightly bent. It may feel weird at first to be facing sideways. We walk from front to back all our live so moving side to side may feel unnatural at first. We have a great ability to learn how to do new things until they are as normal as walking down the street. You will get the hang of it. Don’t worry. Try stepping on a skateboard while holding on to something stable. Like a street sign or a tree. Try jumping on and off while holding on to something stable. When holding on to something roll back and forth and set yourself off balance. Do this to get a feel for how and while you become unstable and the board rolls away from you. Practice shuffling just feet sideways on the board to get used to the grippiness and the way the board rolls and reacts to you standing on it. You will learn quick. 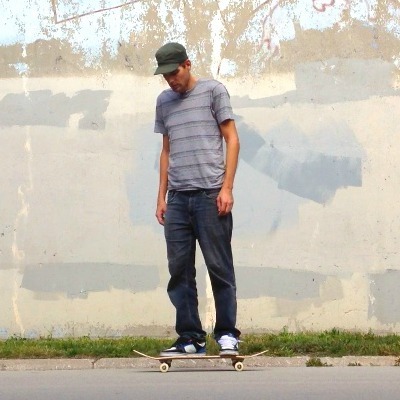 Developing better balance and eventually it will feel pretty normal to step on a skateboard. You will do it without a thought.